INTRODUCTION: C4D is a well-known biomarker of complement cascade. The utility of C4D in identification of antibody-mediated rejection has been known since its incorporation in Banff classification in 2003. Recently, many researchers have turned their attention to C4D deposition in native renal diseases. The present study was done at our tertiary care center to adjudge the significance of C4D deposits in native renal diseases across Indian cohort of patients. MATERIALS AND METHODS: A retrospective study was done on fifty cases of native renal diseases and followed up at 6 months. C4D immunohistochemical analysis was performed on formalin-fixed paraffin-embedded renal tissue sections with antibody against C4D (polyclonal rabbit immunoglobulin G antihuman C4D antibody). RESULTS: All cases of membranous nephropathy, immunoglobulin A nephropathy, and hypertensive nephropathy showed glomerular C4D positivity ranging from 2+ to 3+. Nearly 50%, 50%, 43%, and 40% cases of diabetic nephropathy, membranoproliferative glomerulonephritis, lupus nephritis, and postinfectious glomerulonephritis, respectively, demonstrated positive glomerular C4D deposits. Increased intensity expression of glomerular C4D deposits was in significant concordance with presenting 24 h urinary protein level at the time of biopsy and in follow-up trends; C4D positive cases were noted to have slowed recovery process as evidenced by delay in returning to normal range proteinuria. Higher histological grades in respective native diseases' classification correlated with increased glomerular C4D intensity expression. C4D positivity in other renal compartments did not yield any significant results. C4D is a well-known biomarker complement cascade, which has been extensively studied and accepted as signature of antibody-mediated rejection (AMR). Banff classification for reporting of transplant biopsies, since 2003 onward, clearly earmarks transplant rejection diagnostic entities on the basis of C4D positivity or negativity. C4D is derived from cleavage of the labile thioester bond of C4B. This cleavage provides a covalent bond which helps C4D to anchor to nearby cells where immune complexes are deposited. Antibodies dissociate naturally because of relatively weak hydrostatic and Van der Waals forces between antigens and antibodies, whereas covalent bond of C4D has a much longer half-life. For this reason, C4D serves as a footprint for complement activation. The utility of C4D in the identification of AMR has been known since its incorporation in the Banff classification in 2003. Subsequently, after this accepted role of C4D in transplant biopsies, few researchers started looking for its expression in native renal diseases, particularly those that are activated by complement system. Still, as of now, there is a scarcity of related literature, with only a few of the studies available and that too focusing on some particular entities such as lupus nephritis, immunoglobulin A (IgA), and nephropathy. There were no such related studies available on standard medical literature databases from Indian Subcontinent. 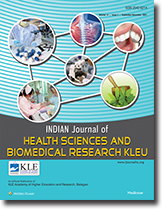 Hence, this study is undertaken to observe and report the trend of C4D positivity in the native renal diseases, commonly encountered in Indian population. The study is an attempt to particularly note the correlating characteristics of C4D deposition with histopathology, proteinuria, and prognostic implications in native renal diseases. In native kidney diseases, C4D deposits are particularly noted across glomerular mesangium/capillary walls, tubules, and vessels, as compared to peritubular capillaries in transplant biopsies. A retrospective study on renal biopsy received between January 2016 and March 2017 was done at our tertiary care center in North India in the state of Uttar Pradesh. Each renal biopsy tissue was stained with hematoxylin and eosin, periodic acid-Schiff along with silver methenamine and Masson's Trichome stain as and when required, examined, and findings interpreted to make a definite diagnosis. Biochemical parameters including serum urea, serum creatinine, and 24 h urinary protein were recorded at the time of renal biopsy and at 6 months of follow up. In our study on 60 participants, 50 cases and 10 controls were included in the study. Out of 50 cases, we had 8 cases of focal segmental glomerulosclerosis, 7 cases each of membranous nephropathy and lupus nephritis, 6 cases of IgA nephropathy, 5 cases of postinfectious glomerulonephritis, 4 cases each of diffuse global sclerosis and minimal change disease, 3 cases of acute/chronic tubulointerstitial nephritis, and 2 cases each of diabetic nephropathy, hypertensive nephropathy, and membranoproliferative glomerulonephritis. Out of ten control cases, we had three cases each of simple renal cyst, chronic pyelonephritis, and xanthogranulomatous pyelonephritis and 1 case of glomerulocystic disease. Further C4D immunohistochemical analysis was performed on formalin-fixed paraffin-embedded renal tissue by immunoperoxidase procedure. Nearly 3–5 μ sections were cut and fixed at 56°C for 20 min and deparaffinized. Unmasking of antigenic sites was done by pressure cooker antigen retrieval method (120°C for 15 min at full pressure and cooled to room temperature). Sections were treated with 3% H2O2 for 10 min to block endogenous peroxidase activity and incubated for 90 min with prediluted primary polyclonal rabbit immunoglobulin G antihuman C4D antibody, manufactured by Dako Corp. at 4°C in a moist chamber. Sections were incubated with link antibody (Dako EnVision Flex™) for 30 min at room temperature. Secondary antibody in form of enzyme conjugate (Streptavidin horseradish peroxidase) and concentrated 3,3'diaminobenzidine solution diluted with substrate buffer was applied. Nuclear counterstaining was obtained by 10% hematoxylin and washing in distilled water. Renal graft section from a kidney transplant patient with AMR was taken as a positive control and autopsy/cadaveric specimen of kidney showing unremarkable histology as a negative control. Slides were evaluated, and C4D staining observed in each compartment of the kidney. Glomerular staining was observed in both capillary endothelium and mesangium. Tubular staining was defined as circumferential positivity of tubular basement membrane and/or granular tubular epithelial staining. Arterial staining was observed in medial with/without mucointimal wall staining. Peritubular capillaries' staining was defined as linear or granular accumulation of C4D along peritubular capillaries. Nonspecific chromogen trapping across sclerosed segments was considered as negative/nonsignificant. C4D positivity in glomeruli, tubules, and peritubular capillaries is semi-quantitatively or quantitatively graded as no or <10% tissue staining: 0, mild or 10%–25% tissue staining: 1, moderate or 26%–50% tissue staining: 2+, and intense staining or >50% tissue staining: 3+. 2+ and above cases were considered as positive. 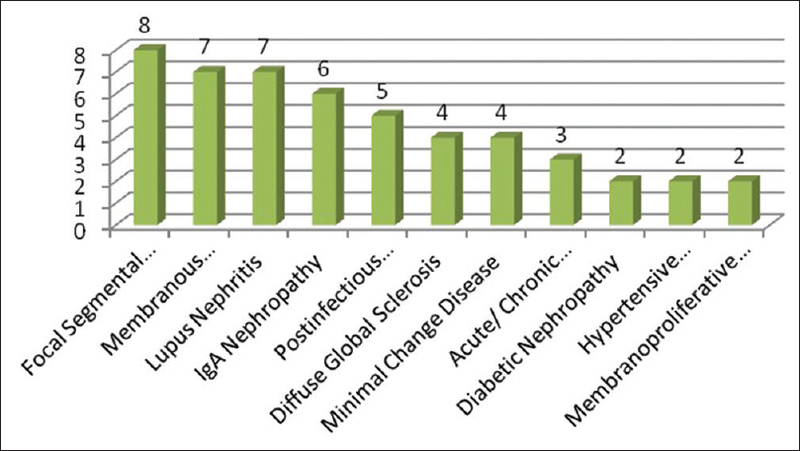 Majority of the patients were diagnosed with focal segmental glomerulosclerosis (16%) followed by membranous nephropathy (14%), lupus nephritis (14%), IgA nephropathy (12%), and rest of the entities [Figure 1]. All cases of membranous nephropathy, IgA nephropathy, and hypertensive nephropathy showed positivity ranging from 2+ to 3+. Glomerular C4D positivity was in 50%, 50%, 43%, and 40% cases of diabetic nephropathy, membranoproliferative glomerulonephritis, lupus nephritis, and postinfectious glomerulonephritis, respectively. There were no glomerular deposits noted in focal segmental glomerulosclerosis, diffuse global sclerosis, minimal change disease, and acute tubulointerstitial nephritis [Figure 2]. Glomerular intensity was graded from 0 to 3+ as earlier described. Subsequently, four subclasses were also framed as per presenting value of 24 h urinary protein. Group I comprised <2 grams, Group II 2–4 grams, Group III 4–6 grams, and Group IV >6 grams of 24 h urinary protein. Cross-tabulation of the above-mentioned variables by Pearson's Chi-Square test yielded significant P = 0.027 [Figure 3]. All the Grade II and Grade III cases (as per their respective grading scheme/classification) showed glomerular C4D intensity of 1+ and 2+, respectively. More than two-thirds of the Grade IV cases and all Grade V cases revealed glomerular C4D intensity of 3+. The results were statistically significant, χ2 =32.754 (df = 6); P < 0.001 [Table 1]. There was no significant association found between glomerular C4D positivity and presenting values of serum urea and creatinine at the time of biopsy [Table 2] and [Table 3]. Tubular C4D deposits were seen in the majority of cases (36/50) included in our study; however, it yielded no statistical significance. All patients diagnosed with IgA nephropathy, postinfectious glomerulonephritis, lupus nephritis, minimal change disease, acute/chronic tubulointerstitial nephritis, diabetic nephropathy, and hypertensive nephropathy patients showed prominent tubular C4D deposits [Figure 4]. Our study revealed a significant association of tubular C4D positivity with 24 h urinary protein at the time of biopsy (P = 0.019). 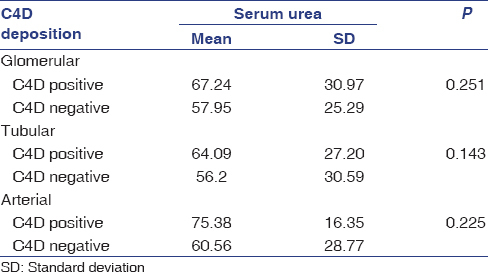 There is no significant association noted between tubular C4D deposits and presenting levels of serum urea and creatinine at the time of biopsy [Table 2] and [Table 3]. Arterial C4D deposits were seen only in diabetic and hypertensive nephropathy in our study [Figure 5]. There was no specific association found, as only two cases showed arterial positivity; the results can be claimed as equivocal. 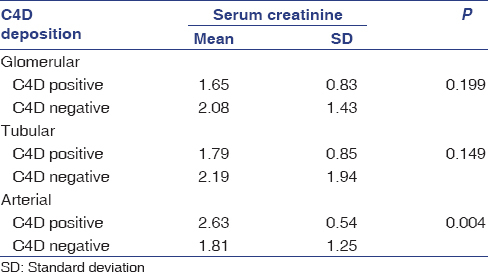 Association with serum urea was nonsignificant, while with serum creatinine, it was significant, but it can be considered equivocal as the cases studied were very less [Table 2] and [Table 3]. C4D deposits across peritubular capillaries were null in all the studied cases. No further workup was carried out in relation with specific disease/24 h urinary protein/serum urea and creatinine levels. Glomerular C4D positive cases among membranous nephropathy, lupus nephritis, and IgA nephropathy subsets showed a significant decrease in 24 h urinary protein value at 6-month follow-up with P = 0.006, 0.002, and 0.047, respectively; however, normal range proteinuria was not achieved in any of the cases. C4D positive cases among other diseases' subsets also showed a decrease in proteinuria, however, neither significantly nor reaching normal range [Table 4]. In other cases, which were C4D negative among those native renal diseases' subsets which had some C4D positive cases too, demonstrated a decrease in proteinuria both significantly as well as reaching within normal range (P = 0.042). In rest of the cases, which were C4D negative and mostly include cases in end-stage renal disease like diffuse global sclerosis (P = 0.214) or progressing toward end-stage like focal segmental glomerulosclerosis (P = 0.233), 24 h urinary protein at presentation, and follow-up showed a nonsignificant deviation. Of all the case included in our study except a subset of C4D positive lupus nephritis patients, there was no significant correlation between presenting and 6-month follow-uP values of serum urea and creatinine. In control patients, the serum urea, creatinine, and 24 h urinary protein value within tubular C4D+ and C4D− patients at 6-month follow-up and baseline were statistically not relevant. C4D molecule by its own virtue has no biological role; however, it implements its action through activation of complement pathways. C4D has its origin from cleavage of thioester bond of C4B. As a result of this cleavage, C4D acquires a covalent bond which helps it to anchor to nearby cells prone for deposition of immune complexes. As a natural phenomenon antibodies are prone to dissociation from immune complexes due to relatively weak binding forces, whereas the presence of covalent bond of C4D, because of its longer half-life, ensures longevity of complement activation processes. Our study was primarily aimed as to look for possibility of C4D deposits across various anatomical compartment in native renal diseases and to compare the intensity of their expression and location with factors such as 24 h urinary protein, serum urea, and creatinine levels. C4D deposits in various renal compartments, namely, glomerular, tubular, arterial, and peritubular capillaries were observed in relation with specific native renal diseases. For glomerular C4D deposits, all cases of membranous nephropathy, IgA nephropathy, and hypertensive nephropathy showed positivity ranging from 2+ to 3+. Glomerular C4D positivity as described in preceding point was in concordance with most of the literature searched around the globe,,,, except for hypertensive nephropathy cases, for which no relevant literature was found. There were sporadic glomerular C4D positive cases noted across other native renal diseases too ranging between 40% and 50% of the respective cases. In a reflection of preceding point, glomerular C4D positivity was 50%, 50%, 43%, and 40% in diabetic nephropathy, membranoproliferative glomerulonephritis, lupus nephritis, and postinfectious glomerulonephritis cases, respectively. This was also in concordance with several studies,,,,, which have shown nonspecific patterns like our study. There were no glomerular deposits noted in focal segmental glomerulosclerosis, diffuse global sclerosis, minimal change disease, and acute tubulointerstitial nephritis. These findings also correlated well with the relevant literature searched. Correlation of intensity expression of glomerular C4D deposits with presenting 24 h urinary protein level at the time of biopsy yielded significant results with P = 0.027. Majority of studies conducted across different renal disease groups have shown as a similar trend for association of glomerular C4D deposits with presenting proteinuria.,,, However, the correlation of glomerular C4D deposits with presenting serum urea and creatinine at the time biopsy was not found to be significant. Tubular C4D deposits were seen in the majority of cases (36/50) included in our study; however, it yielded no statistical significance. This was in sync with other similar studies too, which showed a similar trend., The higher trend of tubular C4D deposits can be attributed to factors related to both higher histological grade in fair number of cases and a high degree of tubulointerstitial inflammation in most of the cases included in our study. Our study revealed significant association (P = 0.019) of tubular C4D positivity with 24 h protein at the time of biopsy. This was in contrary to findings of few similar studies found, possibly due to different patient subgroups and histological grades in the compared studies. Tubular C4D deposits showed no significant correlation with presenting serum urea and creatinine levels at the time of biopsy. This can be attributed to the presence of overlapping features of glomerulonephritis and tubulointerstitial nephritis in majority of cases included in our study. 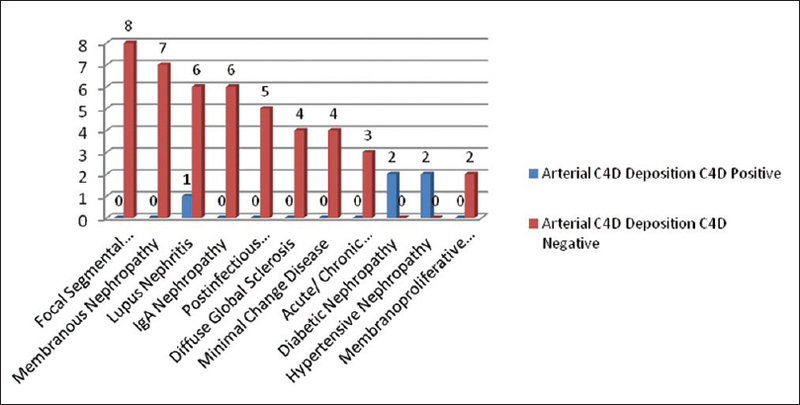 Arterial C4D deposits were seen only in diabetic and hypertensive nephropathy in our study. There was also no correlation noted between presenting 24 h urinary protein and serum urea and creatinine levels. There was no specific study found to support our finding except one, which just recorded C4D positivity across thickened blood vessels in higher grades of IgA nephropathy cases. C4D deposits across peritubular capillaries were null in all the studied cases. No further workup was carried out in relation with specific disease/24 h urinary protein/serum urea and creatinine levels. All the glomerular C4D-positive cases for which follow-up was available showed a statistically significant reduction in 24 h urinary protein levels at 6 months; however, normal range values were not achieved. For C4D-negative cases, a decrease in proteinuria was both statistically significant as well settled within normal range. Thus, it can be interpreted that the presence of glomerular C4D deposits tends to slow down the recovery process during the treatment course. However, C4D-positive cases showed no significant difference in serum urea and creatinine levels at the time of biopsy and 6-month follow. That was expected to as all our cases primarily presented with nephrotic syndrome. Glomerular C4D positivity can be expected in some of the native renal diseases, especially involving etiopathological background of complement activation by classical/lectin pathway such as IgA nephropathy, membranous nephropathy, lupus nephritis, membranoproliferative glomerulonephritis, and postinfectious glomerulonephritis. It is significantly associated with higher histological grades as well as 24 h urinary protein at the time of presentation and also tends to slow down and delay the recovery process. Thus, it can be concluded that C4D can be considered as a novel prognostic biomarker for native renal diseases, especially those with a complement activity etiological background. Racusen LC, Colvin RB, Solez K, Mihatsch MJ, Halloran PF, Campbell PM, et al. Antibody-mediated rejection criteria – An addition to the Banff 97 classification of renal allograft rejection. Am J Transplant 2003;3:708-14. Cohen D, Colvin RB, Daha MR, Drachenberg CB, Haas M, Nickeleit V, et al. Pros and cons for C4d as a biomarker. Kidney Int 2012;81:628-39. Nasri H, Ahmadi A, Rafieian-Kopaei M, Bashardoust B, Nasri P, Mubarak M, et al. Association of glomerular C4d deposition with various demographic data in IgA nephropathy patients; a preliminary study. J Nephropathol 2015;4:19-23. Fabiano RC, de Almeida Araújo S, Bambirra EA, Oliveira EA, Simões E Silva AC, Pinheiro SV, et al. Mesangial C4d deposition may predict progression of kidney disease in pediatric patients with IgA nephropathy. Pediatr Nephrol 2017;32:1211-20. Maeng YI, Kim MK, Park JB, Cho CH, Oh HK, Sung WJ, et al. Glomerular and tubular C4d depositions in IgA nephropathy: Relations with histopathology and with albuminuria. Int J Clin Exp Pathol 2013;6:904-10. Espinosa-Hernández M, Ortega-Salas R, López-Andreu M, Gómez-Carrasco JM, Pérez-Sáez MJ, Pérez-Seoane C, et al. C4d as a diagnostic tool in membranous nephropathy. Nefrologia 2012;32:295-9. Sepe V, Albrizio P, Canton AD. C4d glomerular deposits and disease progression in native idiopathic membranous nephropathy. J Nephrol Ther 2015;5:212. Kim MK, Maeng YI, Lee SJ, Lee IH, Bae J, Kang YN, et al. Pathogenesis and significance of glomerular C4d deposition in lupus nephritis: Activation of classical and lectin pathways. Int J Clin Exp Pathol 2013;6:2157-67. Daram SR, Yalamanchili P, Salinas-Madrigal L, Bastani B. Patterns of C4d staining in patients with lupus nephritis. J Appl Res Clin Exp Ther 2006;6:176. Val-Bernal JF, Garijo MF, Val D, Rodrigo E, Arias M. C4d immunohistochemical staining is a sensitive method to confirm immunoreactant deposition in formalin-fixed paraffin-embedded tissue in membranous glomerulonephritis. Histol Histopathol 2011;26:1391-7. Tanuma Y, Ohi H, Hatano M. Accelerated decay of the cell bound C4b2a complex by serum of patients with membranoproliferative glomerulonephritis and acute poststreptococcal glomerulonephritis. Clin Immunol Immunopathol 1992;62:270-6. Frémeaux-Bacchi V, Weiss L, Demouchy C, May A, Palomera S, Kazatchkine MD, et al. Hypocomplementaemia of poststreptococcal acute glomerulonephritis is associated with C3 nephritic factor (C3NeF) IgG autoantibody activity. Nephrol Dial Transplant 1994;9:1747-50. Bose BM, Pothen L, Parameswaran JK, Poothiode U. Clinicopathological comparative study of C4d positive and negative cases of IgA nephropathy. Immunopathol Persa 2017;3:e02. Sahin OZ, Yavas H, Taslı F, Gibyeli DG, Ersoy R, Uzum A, et al. Prognostic value of glomerular C4d staining in patients with IgA nephritis. Int J Clin Exp Pathol 2014;7:3299-304. Van Es LA, de Heer E, Vleming LJ, van der Wal A, Mallat M, Bajema I, et al. GMP-17-positive T-lymphocytes in renal tubules predict progression in early stages of IgA nephropathy. Kidney Int 2008;73:1426-33.